Recent work by Jim Coplien shows that Scrum is deceptively simply while compressing a complex array of organizational patterns in his book, "Organizational Patterns in Agile Software Development." Jim was surprised when he found that Scrum compresses at least 33 patterns from his book into a concept that can be explained in 2 minutes. It takes over 60 pages of rather dense text to describe these patterns. One of Scrum's design goals was to encapsulate best practices from 40 years of software development into a process that was simple enough for the average IT worker to use for development in less than 2 days of startup time. Jim's research shows that we did a good job of accomplishing that goal. You can download a copy of the complete Scrum pattern as it is part of a draft of "The Scrum Papers." 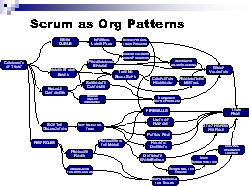 Click here for Jim's presentation on Scrum as a set of patterns.